Pros: It is great for older toddlers and preschoolers, folds up small and is lightweight. Cons: It needs to be inflated. There is no space in the accompanying bag for the pump. The Shrunks Indoor Toddler Inflatable Travel Bed is a great toddler travel bed for kids who are too big for a travel crib and need a portable, compact bed for travel. It dissembles to only 7.7lbs and folds up into a small drawstring bag making it easy for families on the go. Families who travel and want to provide a comfortable bed for their toddlers or preschoolers to sleep on. It can be used on vacations, during camping or for a family gathering at the grandparents’ house. It is also an ideal option for children who have outgrown their cribs or cots, but are not quite ready to sleep in a bed of their own. 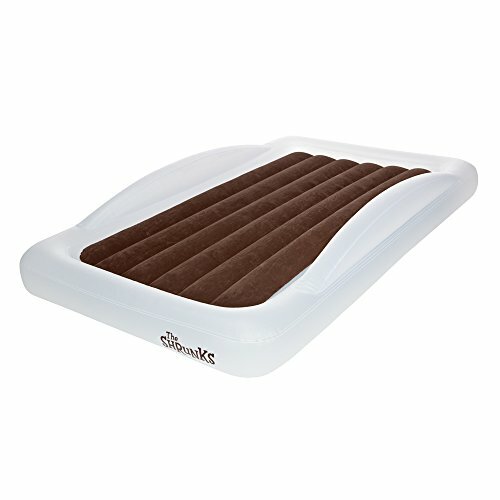 The Shrunks Indoor Travel Bed is inflatable so it needs to be inflated before use. It comes with an electric pump which takes a few minutes to inflate the bed. It can also be used to deflate the bed Any spills, stains or accidents can be cleaned up simply enough. It only weighs 7.7lbs when deflated (excluding the pump). It folds up compactly and fits into an included drawstring bag which makes transporting it easy. As it is essentially filled with air, this lightweight inflatable bed can be easily moved from one room to another. Unfortunately, the carry bag does not include space for the pump as well, so this has to be transported separately. This travel bed is comfortable and does not make an annoying squeaky sound when the child moves like some inflatable beds. A unique feature of this toddler travel bed is its Sheet Tuck system. This allows you to easily tuck in sheets on the mattress itself. The internal mattress is not detachable, but the sheets can be tucked into slits that are available around the mattress. The bed can comfortably accommodate any standard cot bed sized sheets. It is difficult for sheets to slip off, ensuring your child stays warm and comfortable throughout the night. The Shrunks Indoor Travel Bed is not suitable for children under the age of 2. This toddler travel bed is recommended for kids aged 2-6, but since it is 37″ wide and 60″ long and can support 68kgs, many kids can still use this bed for many years after 6. If your child is 2 and you are unsure if they are ready, here’s some tips about moving to a toddler bed. The Shrunks Travel Bed lays on the ground and is not very high. This means there there is little chance of your child accidentally hurting themselves by rolling off. The Shrunks Indoor Toddler Inflatable Travel Bed also has ridges on its sides to help secure the child within the confines of the bed. This inflatable bed is free from harmful chemicals and is lead-free, BPA and phthalates safe. It meets new safety standards. It comes in neutral colors. The Shrunks Indoor Toddler Inflatable Travel Bed is a great option for parents who do not mind inflating a toddler travel bed, have older toddlers or preschoolers and want a travel bed that is lightweight and portable. It will also fit the child for a long time.